I found this awesome site and thought you might like it too. The link is athttp://baxtermill.com/to-not-glue-train-table/. 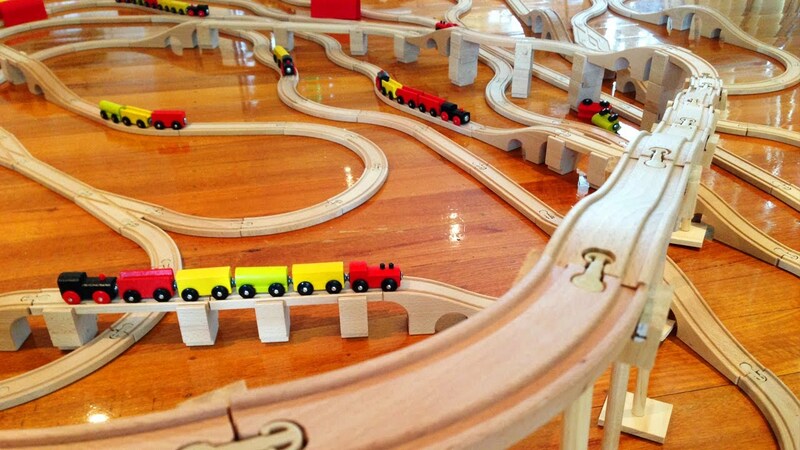 Many parents have taken to gluing their children’s wooden train tracks on their train tables. Witnessing the frustration that these parents and their kids undergo as the tracks fall apart and bridges get knocked over, it is easy to understand why parents have taken this direction. When the tracks fall apart, it is the parents that are tasked with the responsibility of fixing them again in order for their kids to keep playing. The exercise gets really frustrating as the kids knock them over and tear them apart again and again. However, gluing your train track onto your train table may only fix the current problem on to set you up for another one later. When your kids grow a bit older, they will want to build their own tracks. This will prove impossible when the tracks are permanently glued to the table. So what options do parents have to solve the current problem of unstable tracks, while still ensuring that their kids will not be limited to a single formation of the track for their entire childhood? A simple solution exists for this double-edged challenge. The solution, one which parents should really consider, is using semi-permanent sticking options. This ensures that the wooden train set is kept from falling apart every time your kid decides to play and that the formation can be changed in the future when the kid grows tired of the current formation. It is a win-win. Here are some of the many reasons why using semi-permanent means to stick the wooden train track on the train tables is a better solution than permanently gluing it. The fact that by gluing the wooden train track on the table permanently, you effectively turn an open-ended invention into a single purpose toy. 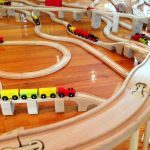 The wooden train sets often present a world of possibilities and can be used in many different ways by the child, enhancing their creativity. They can fit the pieces to form a sword, invent traps and so forth. By permanently fixing the set on the table, all these creative options are eliminated, and it can only be used as a permanent and immovable train set. The time that the train set is either interesting or developmentally beneficial to your child will be significantly shortened if you glue it permanently to the train tables. Pushing a toy train over the same tracks over and over again may only interest a toddler. Even for them, this interest would not last too long. As the child grows older, the exercise becomes too repetitive, too monotonous and just plain boring. Kids whose train tracks are glued to the training table soon outgrow toy trains as opposed to those who have the opportunity to experiment with the different layout options provided by an unglued train set. One of the most intriguing facts about children is how they may show interest in something in public only to lose that interest completely once they get home. This is true for train tables as well. 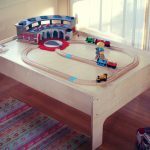 Kids may show interest for train tables in stores and other public places, but show absolutely no interest in a beautiful train table provided for them at home. Often, the best way to renew their interest in the set that you bought them is by taking it off the table. Gluing the tracks on the table eliminates this option. The usefulness of the train set is also greatly limited when the train tracks are permanently glued onto the train tables. The table can no longer be used for other options such as playing LEGOs or doing any other activity on it. Finally, permanently gluing the track on the table is an absolute waste of money. Train sets are not cheap, and anything that limits their use in such a significant way effectively reduces their worth. This, to many families, is a waste of good money. So what are the options, you ask? Removeable Mounting tape. This is ideal because it does not damage either the tracks or the table when it’s time to take it off. Carpet tape. This may be effective for holding the tracks together, but it may also peel the surface of some tables when being removed. You do not need to worry about this with a table from Baxter Mill, though. Our table has an industrial grade finish on it and carpet tape is not going to remove the finish. Suretrack clips are an effective way of holding the track together, but they tend to loosen up with use. You will have to adjust them from time to time. Mounting putty or blue poster putty is also an effective option. The only challenge would be to make the entire track flat and even. Silicone door gaskets are an excellent option. Most users have indicated on the effectiveness of using silicon door gaskets and how easy it is to get the train set to its old fixable state. Easy as A, B, C! You can use small wood screws to hold the track together. This method enables you to rearrange the track at will, and it can be completely removed without much damage to either the track or the table. Cover the table top with felt strips. While this will not hold the tracks together per se, it will stop them from sliding around the table that much by increasing friction between the movable parts. Using other products such as zots clear adhesive dots or better yet, zots zips (for scrapbooking) may also come in handy in securing the train set to the train table, temporarily. Get inventive and creative with various semi-permanent products and help your child enjoy their train sets at their tender age. You will also be providing them with a chance to reap the full creative benefits of the train set as they grow older. However, you may decide to glue your child’s track on the table permanently. Here are a few suggestions on how to do this and still keep the train track interesting for your kid. These fixes will not only ensure that the train tracks are securely held to the table, but will also offer the child an opportunity to play with the set as they grow older creatively. 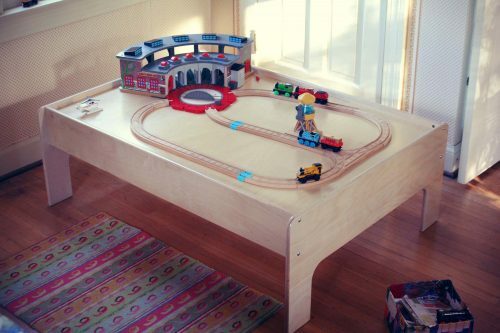 Glue a part of the track on the table and leave other pieces unglued for your kid to rearrange them as they wish. You could glue the tricky parts such as bridges and allow your child to play with the rest as they like. If you have a toddler, glue a small train set on the table for them to play with before starting a complete collection when they grow older. A modular train table may prove an effective option. The train tracks are glued on the table, yet the small tables can be rearranged in many different forms to keep the train set interesting.